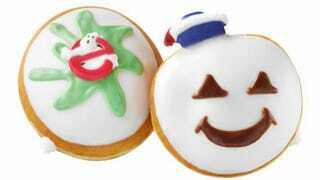 To celebrate the 30th anniversary of Ghostbusters, Krispy Kreme is offering special, limited edition donuts inspired by the movie. "Limited edition donuts" is a prestige title that warrants your respect and honor, by the way. According to the Hollywood Reporter, they will only be available from Sept. 29 through Oct. 31. In an homage to the Bill Murray-starring film's two most recognizable apparitions, one doughnut will feature the Ghostbusters logo and a Slimer-inspired splatter of green icing, while the Stay Puft Marshmallow doughnut resembles that villain's face, complete with a sailor hat made of sugar. Both doughnuts contain white cream in the center. Our very own Kelly Faircloth issued a resounding NOPE to the last offering of specialty themed-donuts, which were basically just a couple of gross looking peeps forced to become symbiotic with a donut and then drowned in a sea of neon sugary goo. "Quite possibly the sweetest doughnut I've ever had!" "Krispy Kreme donuts = delicious. Ghostbusters = amazing. Ghostbusters Krispy Kreme donuts = the week has peaked, which is a good thing since I'll now be in a sugar coma through Friday. The crystallized sugar hat on the Stay Puft Marshmallow Man was an especially sweet touch, albeit also the death knell for my blood sugar levels. Or maybe that honor should go to the marshmallow cream filling. Whatever, I'd eat another." This is really great and everything BUT WE NEVER GET TO DO ANYTHING LIKE THIS AT JEZEBEL. Not that it would matter since I don't work in the New York office but it's the thought that counts. Sweet, sugary glazed thoughts. In closing, I leave you with this controversial ideological debate point to passionately discuss, because it is vital to the entire human race: Dunkin Donuts >>>>> Krispy Kreme.